Many rum and whiskey producers are now utilizing second or third use barrels where aromatic sweet wines were initially aged -- Sauternes, Pedro Ximénez, Port or Madeira -- to finish their products prior to dispatching them to market. These finishes, first initiated in Scotland for some of their Single Malts, are creating aromatics that instill in the liquor an additional level of complexity and make them much more desirable to their international clientele. WhistlePig is actually a Canadian import that is bottled in a former dairy farm in Shoreham, Vermont. Aged for 10 years, the “classic” WhistlePig is 100 proof (50 percent alcohol by volume), 100 percent rye whiskey. It offers interesting, lively spice notes of clove, allspice, nutmeg, and cinnamon, with hints of orange peel, vanilla, toffee, caramel, and butterscotch, and a long, dry spicy finish. This is a rich, full whiskey. There are two other expressions, the 12 Year Old World and the Boss Hog, a 13.5 year overproof (117 to 124) expression. Both are much more aromatic, with the Old World having a slightly sweeter finish. The Boss Hog utilizes a quadruple barrel aging process and spends nearly 14 years in a combination of new American oak and early use bourbon barrels. I recently had the chance to not only taste the 12 year old that was finished in early use Madeira, Sauternes and Port barrels, but I was also given the opportunity to create my own blend, after a couple hours of experimentation. The brand’s blend is made from finishes of aged 12-year-old whiskey -- 63% Madeira, 30% Sauternes and 7% Port -- and is called 12 Year Old World. It is a marriage of three finishes that highlights distinctive flavors to create an exceptional spirit. My own blend was 70% Sauternes, 18% Port, 12% Madeira; it was slightly sweeter and I really treasure whatever is left in the bottle. Another exceptional American Bourbon that has been finished in Port wine barrels is Angel’s Envy Cask Strength. 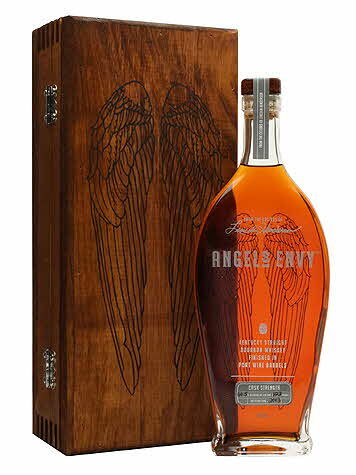 Created by the late Master Distiller Lincoln Henderson who came out of retirement to create the Angel’s Envy line, the Cask Strength has been a limited edition release in select markets. The 2016 release was made from a blend of hand-selected barrels and is 124.6 proof. Each year, the proof varies based on the barrels selected. Once the blend is created, it receives a lengthier finishing in the Portuguese Port barrels. We tasted the Cask Strength adding a dash of water; it helped to release the deeper flavors of the whiskey. The color is 18K gold with amber highlights. The nose was unusual for a whiskey featuring English toffee, fruitcake, and spices with cloves and cinnamon dominating. There were hints of rose petals, strawberries and cigar box. The palate was dominated by dried figs and dates, with some caramel and a hint of butterscotch. The long finish was buttery. This American whiskey can certainly stand toe-to-toe with some of the top Scottish single malts. © February 2017 LuxuryWeb Magazine. All rights reserved.